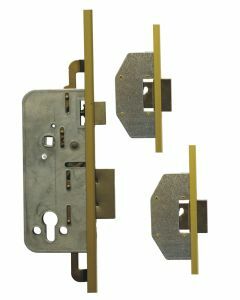 Ucem Replacement Multipoint Door Locking Mechanisms and Gearboxs to repair UPVC and Composite Doors. The Ucem door locks are a multipooint locks specifically built to suit both the Upvc and composite timber door markets. In particular they are found on composite door types and have a unique 85mm pz distance from the centre spindle to the centre key hole. The lock is generally key operated to throw the security bolts into the locked postitions.